Note: Sorry for the lag in posts, but now that finals are coming to an end, Damon and I will try to upload some wrap-up thoughts on the basketball season (we have an interview with the seniors already recorded) and will start to look forward to the 2013 football season and the 2013-14 basketball season as the summer continues. Dylan Sinnickson will be making a unique mark on Middlebury sports history next season. The rising junior, already a major contributor on the hardwood and the diamond, will be cleating up for Coach Bob Ritter’s offense on the gridiron this fall. Sinnickson, listed at 6’5″ and 195 pounds, plans to play wide receiver for the Panthers, hoping to develop chemistry with Mac Foote on Middlebury’s record-breaking offense. “Watching our passing offense the last couple years has really been fun,” said Sinnickson, who thinks he has the athleticism to make an impact on the outside right away. “I have been clocked several times at 4.5 seconds for the 40-yard dash but that needs to transition into game speed and learning how to get open. I have spoken to Coach Ritter and many of the assistants, and they are happy to have me.” In addition to his speed, Sinnickson’s aerial abilities stand out on the basketball court, and he could become an elite vertical threat if he harnesses that ability. Sinnickson just finished a spring baseball season in which he led the team in batting average (tie), hits, home runs, triples (tie), on base percentage, and slugging percentage, ranking second on the team in steals, and starting every game. Although he missed this basketball season due to a pre-season broken arm, he was the standout freshman on the 2011-2012 Sweet 16 team that spent much of the season ranked first in the country, averaging 5.7 points in 11.4 minutes per game on 53% field goal shooting. Before his injury last season, we projected Sinnickson to be the sixth man on this year’s team. Football season will end about two weeks before the first basketball game. “I’m used to making quick transitions,” said the soon-to-be three sport athlete. Because he missed all of this past season due to injury, Sinnickson is eligible for a fifth year on the basketball team, an option he plans to pursue, saying that it is “just a matter of paperwork now and getting the approval of the NCAA.” If he stays for a fifth year, that will put him in the senior class with Matt Daley, Henry Pendergast, Jake Nidenberg, and Connor Huff. From a football potential perspective, the ceiling for Sinnickson might be Trinity’s A.J. Jones, the lightning-fast 6’2,” 203 pound wideout, who was a one-dimensional threat last season but made the most of his field-stretching ability, averaging 28.7 yards per catch on his way to five touchdowns for the undefeated Bantams. While Sinnickson’s route-running and catching abilities might be even more raw than Jones’s, his verticality could make him a more viable red zone target. 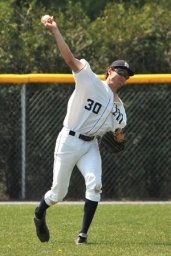 Asked if he had ever heard of a football-basketball-baseball Middlebury athlete before, Sinnickson said “I think there may have been one guy who did it a decade or two ago.” If he makes it through all three seasons next year, Sinnickson could be a once-in-a-generation Panther. UPDATE: Here is a video of Sinnickson training for the basketball season last fall. This was written by Jeffrey Hetzel. Posted on Friday, May 17, 2013, at 12:20 am. Filed under Football, Men's Basketball. Bookmark the permalink. Follow comments here with the RSS feed. Post a comment or leave a trackback. Does anyone know if he played football in High School? I hope he stays in one piece! He did not. And we hope so too. 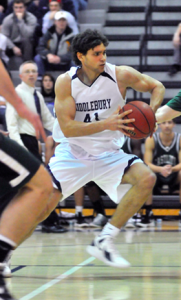 “Better than rumors”.. summer Midd Bball news..updated now at ‘clubbo44.blogspot.com’. Enjoy. Clubbo. Also any word on what position he might play? It would certainly “make more sense” from a basketball standpoint, but Sinnickson has multiple desires and goals and playing football is one of them. I’m sure Coach Brown would prefer all of his players focused on just basketball, but there are factors beyond the best interests of one team motivating Sinnickson’s actions.